Cold-cathode Numerical Display Tubes - "Nixie" Tubes. In the the triode, which is the simplest type, is a cathode, an anode, and a grid. The cathode is heated, which causes a thin cloud of electrons to be emitted from its surface. The nearby anode is given a high positive voltage which attracts these electrons and so a current flows. By varying the voltage on a grid which is between the anode and the cathode, and is in the path of the electrons, the flow of the electrons (ie. the current) can be varied. 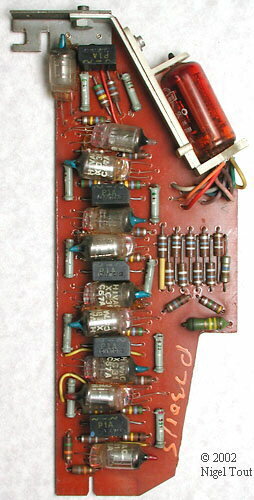 Detail of the keyboard decoder board showing the GS10D "Dekatron" decade counter tube, with a small ECC81 vacuum tube (thermionic valve) to its right, which is part of a blocking oscillator circuit providing driving pulses at a rate of 4000 per second. 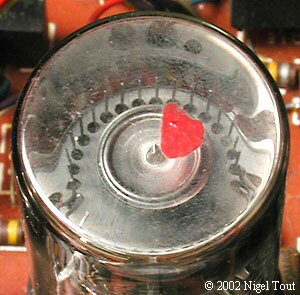 One of the ECC81 double-triode vacuum tubes (thermionic valves) used in the Anita Mk8, with a 9-pin base. Each of the dark-grey vertical structures contains one triode. 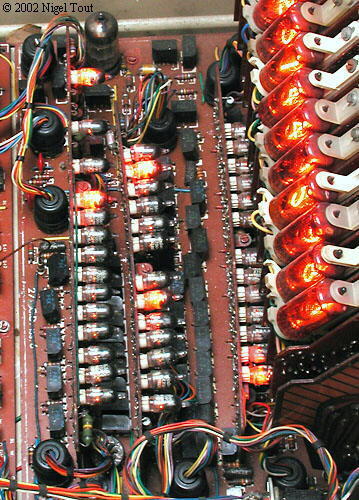 Although the early Anita calculators do use a small number of thermionic valves, the logic circuits incorporate large numbers of Cold Cathode Tubes. In contrast to the thermionic valves the Cold Cathode tubes contain a rarefied inert gas (e.g. neon), and electrons are emitted in an avalanche from the unheated cathode when the voltage between the anode and cathode reaches a high enough value. The flowing current excites the gas inside and produces a glow - this is the way that the small neon mains indicator lamps work. A relatively small voltage on a control grid between the anode and cathode has a great effect on whether a current of electrons flows or not and can switch it on and off. 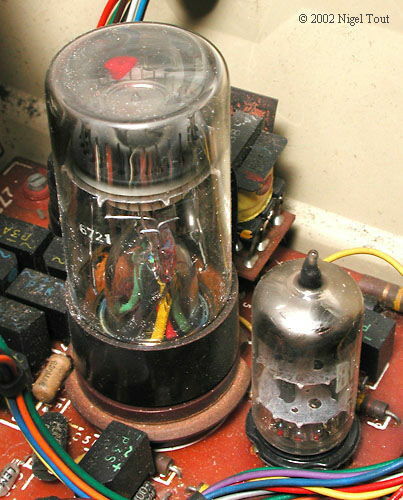 In the Anita a type of Dekatron, called a Selector tube rather than a Counter tube, is used which has individual connections to each of the ten cathodes. This tube is used to provide "scan" pulses to each row of keys in the keyboard so that value of pressed keys can be decoded. 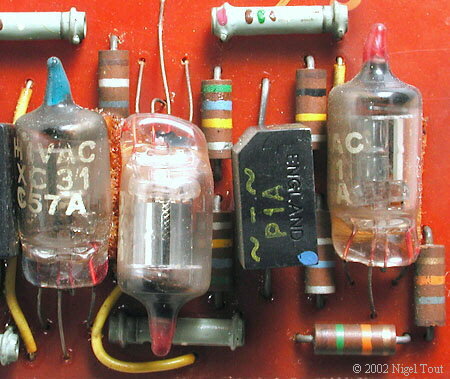 Often referred to as "Nixie" tubes or Numicator tubes. The cold-cathode display tubes of an Anita 1011LSI calculator in use. Note also the small neon lamps used to indicate the decimal point (the third from the right is energised). The cold-cathode display tube and the neon lamp operate on the same principal. The simple neon indicator lamp consists of a sealed glass tube with two closely spaced non-heated electrodes, an anode and a cathode. The tube contains neon gas at very low pressure together with a small percentage of mercury vapour. They are often used in AC power sockets to indicate that they are switched on. The gas in the tube initially acts as an insulator and as the voltage between the anode and cathode is increased practically no current flows. However, a little of the gas in the tube will be ionised by naturally occurring cosmic rays, radioactivity, or ambient light into positive ions and negative electrons. The electric field being applied to the electrodes will cause the positive ions to move towards the cathode and the electrons towards the anode. As the applied voltage is increased so these will start to move faster and faster, colliding with other gas atoms and ionising them by knocking off electrons. At the "striking" or "ignition" voltage the ions and electrons move which such high speeds that an avalanche of further ions and electrons is produced by all the collisions. This leads to a high current flow, which is kept in check by an external resistor in series, and an amber glow at the cathode. The cold-cathode display tube is a neon lamp with multiple cathodes. Each cathode is shaped like one of the digits 1 to 9, and they are mounted in a closely spaced stack. In front of the stack is the anode, formed from an open mesh grid visible in the photograph above. When the striking voltage is applied between the anode grid and any of the cathodes a discharge is formed and the gas around the cathode glows. Since the cathode is shaped like a digit the glow is also in the shape of that digit - see the photographs. In use it can be seen that the numbers are in a stack since some numbers appear further forward in the tube than other numbers. The life performance of a numerical display tube depends to a great extent on the length of time the discharge is maintained on a single cathode (ie. number). This is because in any gas-discharge device the cathode is subjected to constant ion bombardment which removes material from the cathode and deposits it elsewhere in the tube. This "sputtering" is unavoidable, but is limited by keeping the peak current as low as possible, consistent with visibility of the display. If a display tube is kept with one cathode constantly glowing (ie. one number displayed all the time) then material is sputtered from that cathode. This only affects the glow of that cathode a little, but the sputtered material lands on the other cathodes and affects the current required to make them glow, and can lead to uneven illumination. If the discharge is cycled between characters regularly, this gives a much improved life since each cathode, although receiving some sputtered material, is subjected to the cleansing action of bombardment. The normal figures quoted in published data for the life of a numerical indicator tube is 5,000 hours with a continuous display of one character, and 30,000 hours when sequentially changing from one digit to the next every 100 hours or less. Cold-cathode numerical display tubes are often called "Nixie" tubes though this was a trade name of Burroughs Corporation which was an early developer of this technology. Other names used are Pixie tube and Numicator tube. For more information see Tom Jenning's "Nixie Indicators and Decimal Counting Tubes" pages at http://fido.wps.com/texts/decimal-tubes/index.html. Nixie tubes continued to be used in calculators into the early 1970s. 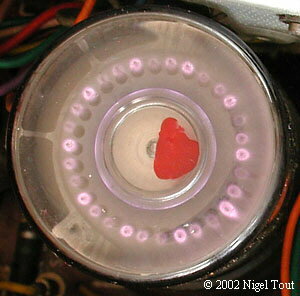 The cost of a Burroughs Nixie tube in 1971 was about $2 for lots of 10,000, which made them very competitive. However their size and high power and voltage requirements were disadvantages.